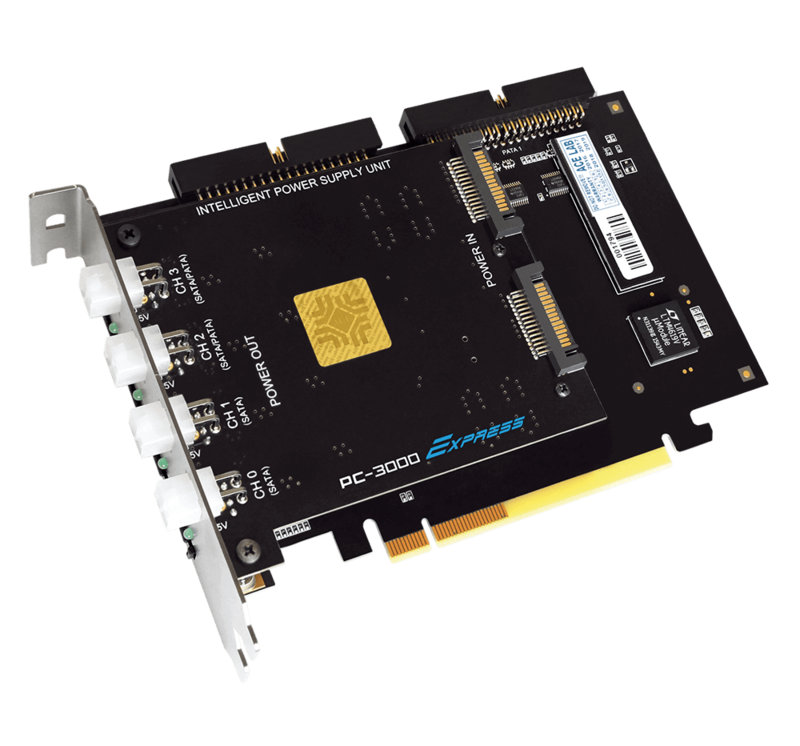 The PC-3000 Express is a hardware-software solution intended for diagnosing and repairing HDDs based on SATA (Serial ATA) and PATA (IDE) interfaces for numerous vendors (Seagate, Western Digital, Fujitsu, Samsung, Maxtor, Quantum, IBM (HGST), HITACHI, TOSHIBA), for various capacities (from 500 MB to 8 TB) and various form factors: 3.5" - desktop drives, 2.5" and 1.8" - laptop drives. 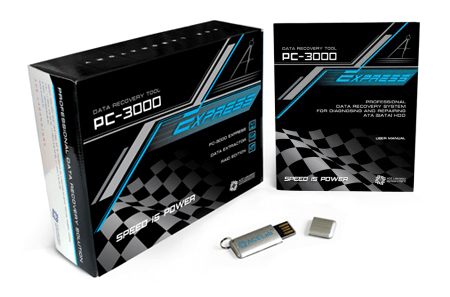 The PC-3000 Express coupled with the Data Extractor Express forms the PC-3000 Express Professional System that enables you to recover data from SATA, and PATA (IDE) HDDs. If you wish to repair these HDDs, you need only the PC-3000 Express, and for data recovery you need both the PC-3000 Express and the Data Extractor Express. 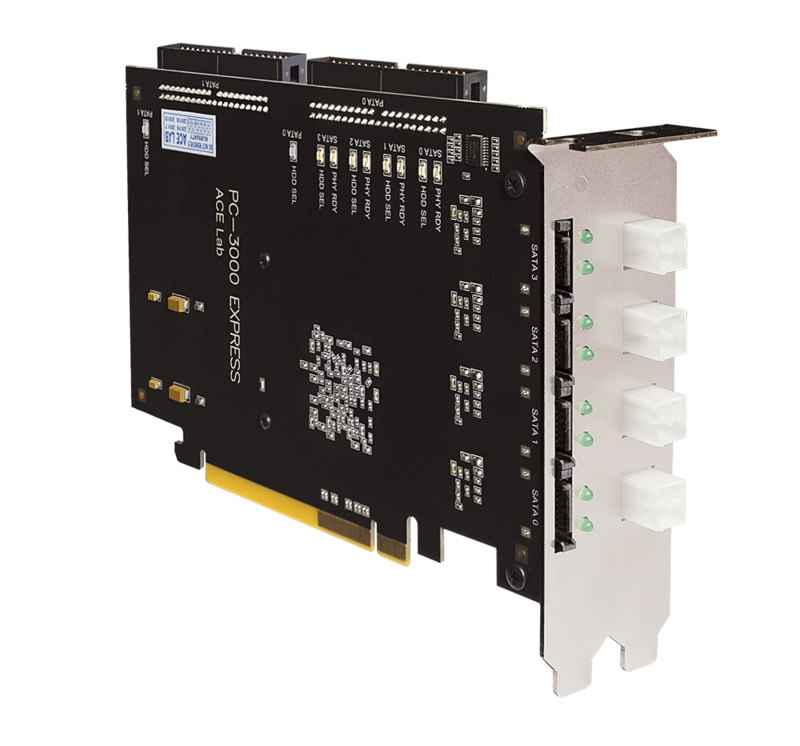 The new powerful PC-3000 Express is a six-port tester-board which is inserted into a PCI-Express expansion slot. 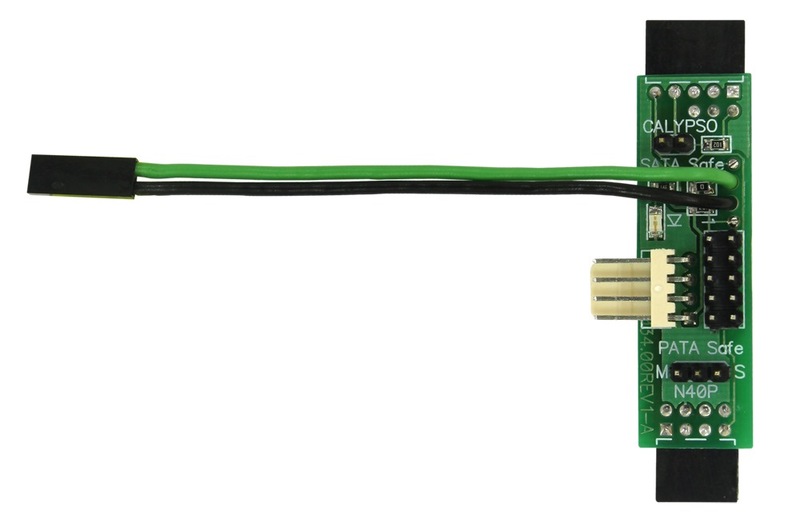 Six diagnostic ports are 4 SATA ports (data transfer speed up to 133 Mb/sec) and 2 PATA ports (speed up to 100 Mb/sec). The primary ports are SATA0 and SATA1 while SATA2 and SATA3 are switchable with the PATA ports (PATA0 and PATA1). 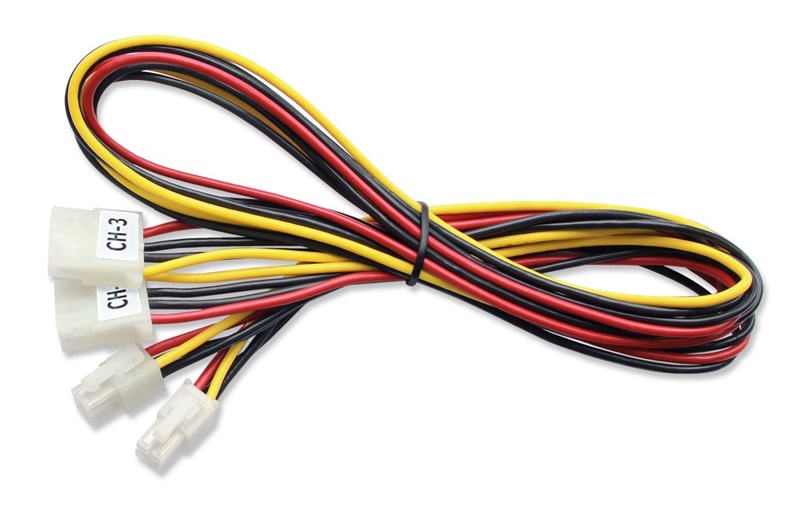 You can connect four drives to the PC-3000 Express simultaneously - two SATA drives and two SATA or PATA drives, depending on your needs. Thus, you can work either with 4 SATA drives or 2 SATA and 2 PATA at the same time. 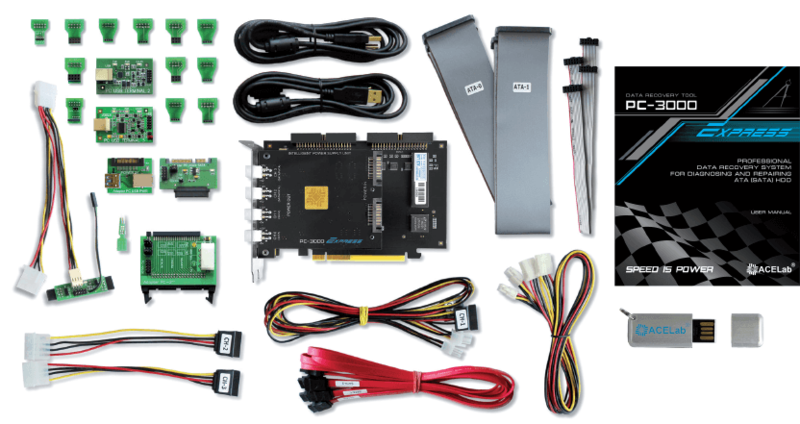 When developing the new PC-3000 Express system we used our “know-how”, all gained experience and requests from our users who work in data recovery. As a result, we have achieved a significant increase in performance and efficiency, making this professional product the best tool for the contemporary data recovery industry. 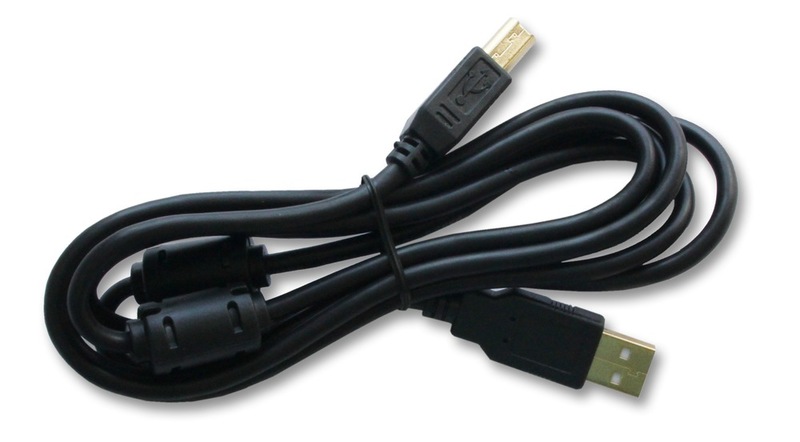 All ports are separable and independent. 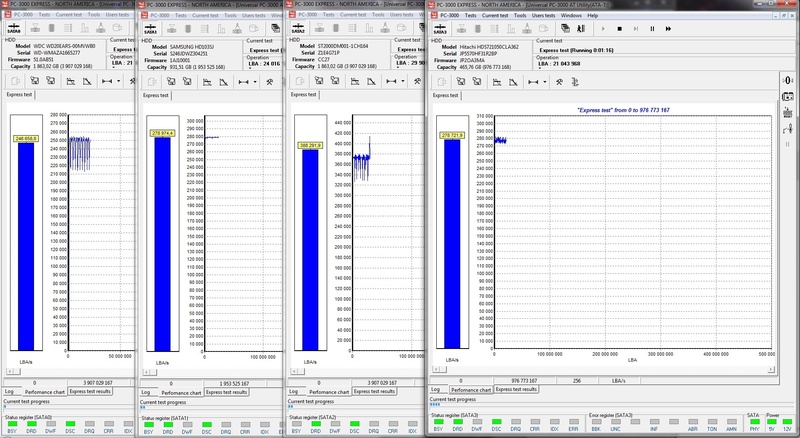 Performance is maintained almost at the same level even when all ports have simultaneous loads. 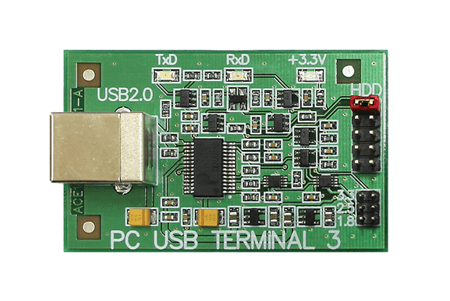 This has become possible because of efficient use of hardware buffering of the data transferred from the 4 UDMA ports through the PCI-Express 4-channel bus. A 4-channel Power Supply Unit is used to power the HDDs which are connected to PC-3000 Express. 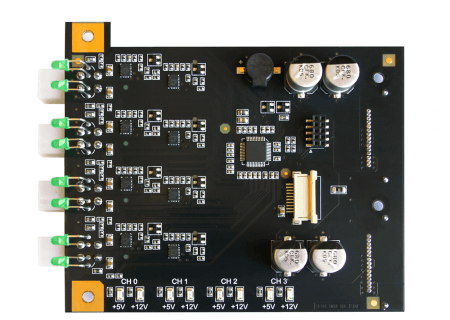 The Power Supply Unit protects the HDDs from overvoltage and overcurrent. In case of emergency, the HDDs will be powered off automatically. 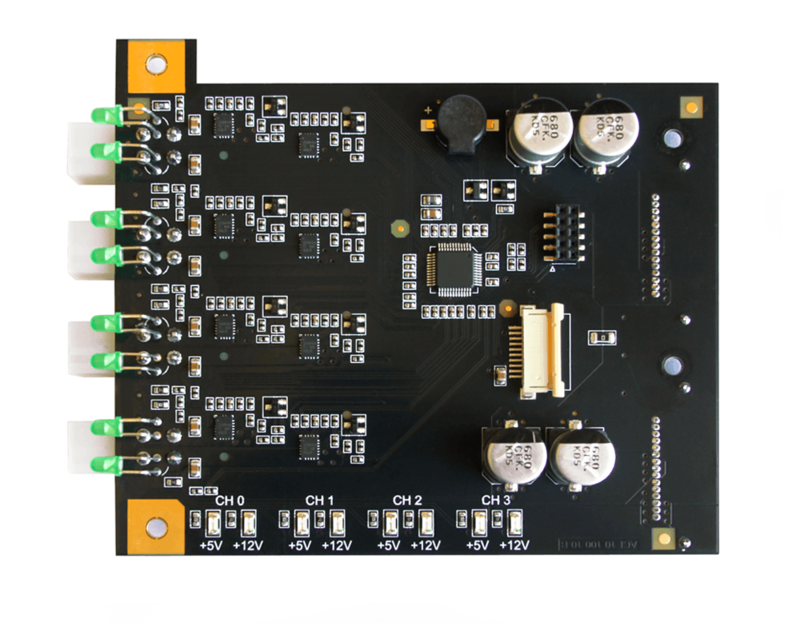 Furthermore, each channel has feedback with the PC-3000 software for monitoring the stability of +5V and +12V voltage supply and informing the user about any problems in power circuits. The oscilloscope functionality. You can get a graph visually representing the precise information about the current power status in real time. This feature allows to perform advanced HDD diagnostic and determine the cause of failure. 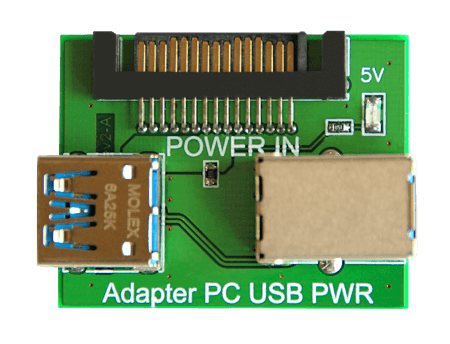 The Power Supply Unit is equipped with a sound speaker which signals about the PC power supply unit failure or HDD overcurrent. Triggered protection system turns off the voltage on the corresponding channel. Welcome to our Blog to read more about the new features and learn how to use them. One of the most important new features of the PC-3000 Express is to allow for launching of the PC-3000 utility and the Data Extractor tasks as separate OS processes. The "PC-3000 Resource manager" software makes using the new PC-3000 Express very easy and effective. The "PC-3000 Resource manager" manages port and related process activity, controls the status of the ports, checks process conditions and kills processes when it is necessary. Once a process is started it can use any number of PC-3000 Express ports. For instance, four processes can be launched for each port or two processes can be launched: the first one works with three ports and the second one only with one port and so on. Supported HDD: 500 MB - 8 TB: 3.5", 2.5",1.8",1.0"
A Hard Disk Drive (HDD) consists of three main parts: the Hard Drive Assembly, the printed circuit board and the internal software. If one of these parts is damaged, the HDD does not work. The PC-3000 allows you to diagnose the HDD, fix damaged HDD modules, switch off defective heads, block access to the damaged area of magnetic surfaces, get access to the user data and many other functions. HDD diagnosis can be done in standard (user) and technological (factory) modes. 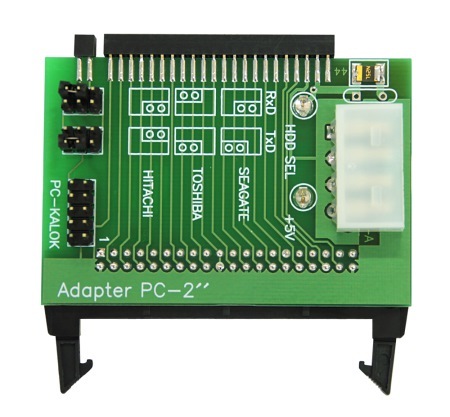 There are special PC-3000 adapters used for switching the HDD into technological mode to get access to the internal HDD software and user data. To make initial diagnostics, the PC-3000 universal utility is launched. It diagnoses the HDD in user mode. The following checks are done: if the HDD is identified and if the HDD is password locked; check of surface access by LBA to the user data area and HDD translation system etc. If there are any HDD malfunctions, a special vendor-specific technological utility (intended for a specific HDD vendor) is used to repair the drive and gain access to user data in technological mode. 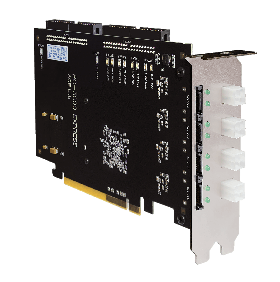 The PC-3000 Express includes 16 special utilities used for various vendors, architectures and HDD families. Special utilities help to conduct HDD diagnosis on a low level, reveal damages and try to exclude them using special program methods and gain access to user data. 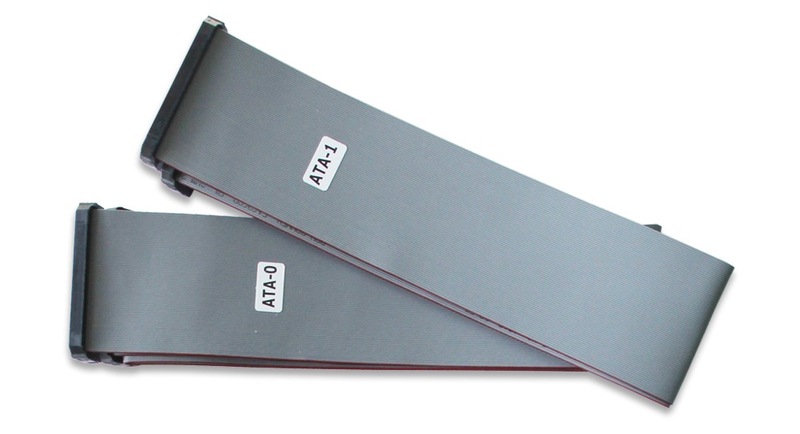 If you wish to only repair the HDD and you do not need user data, you can make full drive initialization, switch off damaged heads, hide defects on the magnetic surface and reconfigure the HDD. In many cases it is not necessary to fully repair the HDD to recover data. It could suffice to correct the internal HDD software. This allows for temporal access to user data and you can read the required information. If one of the magnetic heads is damaged, we can get data access through the remaining heads using “MR-Head Shift technology”. The damaged head is substituted by the adjacent correct magnetic head. It allows for keeping the integrity of the translated data and for reading big data volumes without having to exchange the head stack. If there is a problem with the initial HDD initialization, the detailed start process log can show some information that helps to identify the damaged program modules with service information. Service area copies can be switched over to make the correct system head initialization. If the initialization process fails due to the problem with loading program modules into RAM, you can use the special Loader that creates essential HDD content into RAM. Technological mode allows reading of data using physical parameters in PZCHS or line physical area with ABA. It is very often the only way to read data from significantly damaged surfaces. When the HDD PCB is damaged you can use another correct PCB taken from an HDD donor. This will save a lot of time in gaining access to user data. 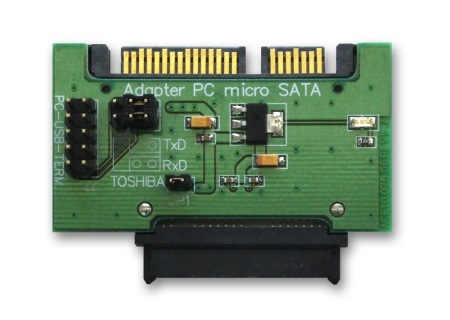 USB HDD access can be done using the COM port or adapted SATA HDD PCB. 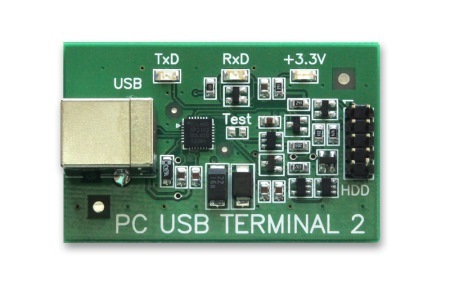 How to use the PC-3000 Express to repair HDDs? HDD PCB is diagnosed. It helps to evaluate how difficult it is to repair this HDD and if it is worth doing it. Board can be repaired or substituted by another board taken from an HDD donor. Flash ROM is checked for integrity and version correspondence. If necessary, they are rewritten from the PC-3000 resource database. Magnetic heads are checked, bad heads are disabled. HDD service area is diagnosed. Service information modules are checked on all copies. Damaged modules are recovered or overwritten in accordance with reference data. Some service modules are cleaned and logs are reset. Calibration is launched for those HDDs where it is possible to do it. Searching the bad sectors and tracks on HDD surfaces and hiding them. In case of seriously damaged surface and numerous bad sectors, this surface area is disabled. If defects are minor and local, separate areas can be switched off or defects can be hidden by using an HDD backup zone, HDD capacity remains the same. For some drives SelfScan procedure can be launched. Available HDD logical space is determined. Max LBA parameters, model name, serial number, etc. are formed. 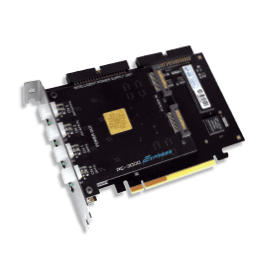 The PC-3000 Express Professional system has a massive database of factory firmware resources: FLASH ROMs, service area modules, service area tracks and other HDD critical resources. The database is systematized and stores all data in compressed format. It allows getting quick and easy data access and sharing firmware resources between several PC-3000 Kits. There are two dedicated modes intended for experienced users: integrated script system and ATA commander. Script system – allows creating algorithms used for issuing commands to HDDs in Visual Basic Script including data preparation and results interpretation. Advanced object model is used for getting access to HDDs. This object model is used by PC-3000 utilities. This algorithm can be added to any PC-3000 utility as a "user" mode. 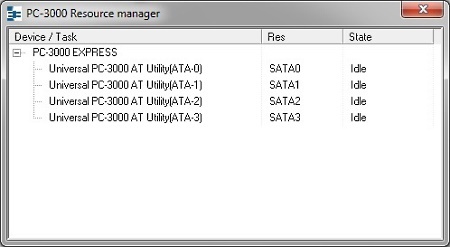 ATA commander – interactive mode that allows issuing commands to HDDs (including technological commands) even by a user who does not have programming skills. You can set values for HDD registers (including registers for LBA 48 mode), and prepare and provide HDD data commands using a binary text editor. The sequence of supplied HDD commands can be classified by types and saved to file for later use or for sending to another PC-3000 owner. Judging from HDD command data, ATA Commander can generate script text for using it from Script system or as a "user mode". 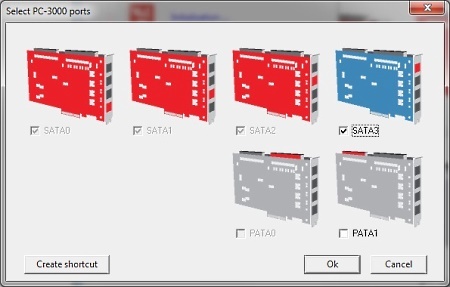 PC-3000 software received a new interface mode which makes user experience significantly easier and more efficient. The new easy mode interface is a dashboard with quick-launch buttons allowing forensic experts, data recovery engineers and HDD repair technicians to perform a lot of routine, but necessary steps in automated mode. 2. Reading and analyzing drive identification data. 3. Reading and analyzing drive SMART data. 4. Performing quick drive test to check the drive's condition. 5. Performing complex test for comprehensive examination. 6. Removing password if a drive is security-locked. 7. Viewing Data (a DE task without copy creation). 8. Creating Data copy (a DE task with copy creation). 9. Working with previously created tasks. The Easy Mode interface helps you solve simple cases quickly by saving time on many routine operations. Use it when you know the drive is not physically damaged. For physically damaged drives, it’s still highly recommended to use full PC-3000 functionality. Those who are planning to enter the data recovery field will find the simplified interface extremely useful. The new PC-3000 easy mode enables them to organize and streamline drive identification, testing, data imaging and recovery operations. In the future the PC-3000 easy mode is expected to be enhanced with ready-made solutions for typical problems in specific drive families and models (selected automatically based on diagnostics results) as well as creation of copies with hash calculation in e01, aff, and raw formats. Read more about the technical features and capabilities of the new interface in this blog post. August 08, 2018 The new versions of PC-3000 Express/UDMA-E/Portable Ver. 6.5.14, Data Extractor Ver. 5.8.5, Data Extractor RAID Edition Ver. 5.8.5, PC-3000 SSD Ver. 2.6.5 are available now! ACE Lab is committed to enhancing PC-3000 upon our users experience. This major update delivers a lot of useful features, plugins and support for new drives and controllers. Furthermore, PC-3000 Express now works with the PC-3000 SAS ports in Data Extractor! For a detailed list of enhancements please follow the link below. December 11, 2017 The new versions of PC-3000 Express/UDMA-E/Portable Ver. 6.4.14, Data Extractor Ver. 5.7.7, PC-3000 SSD Ver. 2.5.8 are available now! July 21, 2017 The newest versions of PC-3000 Express/UDMA-E/Portable Ver. 6.3.12, Data Extractor v.5.6.8 are available now! May 25, 2017 The newest versions of PC-3000 Express/UDMA-E/Portable Ver.6.3.6, PC-3000 SSD Ver.2.4.3, Data Extractor Ver.5.6.2, are available now! October 26, 2016 The newest versions of PC-3000 Express/UDMA-E/Portable Ver.6.2.18, PC-3000 SSD Ver.2.3.1, Data Extractor Ver.5.5.2 are available now! April 22, 2016 The newest software versions PC-3000 Ver. 6.1.12, Data Extractor Ver. 5.4.1 and PC-3000 SSD Ver. 2.0.3 are available right now! September 29, 2014 The new versions of PC-3000 Ver.5.8.14 and Data Extractor Ver.5.2.8 are available. The English and Japanese versions of the PC-3000 Express, PC-3000 UDMA, PC-3000 Portable, PC-3000 SAS Professional Systems are available. All authorized technical support users can feel free to contact us for getting the latest version of the PC-3000 Software. July 07, 2014 The new version of PC-3000 Ver.5.7.12 and Data Extractor Ver.5.1.12 are available. the current new software version will work with all three products: PC-3000 Express, PC-3000 UDMA and PC-3000 Portable. If you'd like to receive a quotation, please fill in the form. Our sales representatives will contact you soon.